You see how this metal bar that holds relay looks from the other side? So you should be able to slide it down without removing the screw. Note there is a small clip in the middle of the metal holder, so you need to jump over it when trying to slide it. My friend can't get it out. He will ask the help of a mechanic. The ralay is "clicking" when the key is in position 2. He can feel and hear that. That means that the relay is working. But the arrival of 9 V instead of 12V at the fuel pump can still mean that the relay is bad/electrical resistance in the relay? There is also fuel pump relay, which, I think, is located by headlamp, right hand side. Since you have 9V on fuel pump, might be good to see that terminals on fuel pump relay are not corroded and provide higher resistance. Sorry Roverlike, I have been ill and I have missed your reaction. I 'll let my friend look for it. Thanks! My friend checked and did not find a fuel relay behind the right lamp. He only found an aircon system ecu. Next to it there was an emty relay reciever. (but that can't be the problem. The relay has never been there. Another place? A mechanic who has been there thinks its the ignition module (placed on the shock absorver/spring) on the left weel under the hood (hitatchi). As paul carlton said on this forum. Replace it? 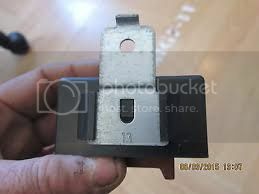 If you have spare ignition module you can swap it and see if it will solve the problem. Nothing to loose. I don't have a spare unit. I'll try to buy it . at http://www.onderdelenzoeker.nl" onclick="window.open(this.href);return false; (second had). I'll try it also at Rimmerbros.co.uk. Or do you know another store to buy it (second hand)? Actually eBay is my source of spare parts and I have pretty good experiance. However you would need one good replacement for which you know it is working. In such case I am buying new parts. A new one is best bought at Rimmerbros.co.uk? I am using Rimmerbros to compare prices. I see what is part number I need and try to find new one on eBay or somwhere else. If I can get new one for lower price I take it. Otherwise I will take new one at Rimmers. Mechanic/electrician has checked the Rover. The Rover starts , but in 1 or 2 minutes it quits again. cable from bobine to power distributor has been replaced. : this cable was burned/there was a short circuit. No solution. The electricain asked me for the electral circuit design of this car (rover 827 si 20/8/1992). Any idea where i can find that? In dutch: Heeft iemand het electrisch schema van een rover 827 si (misschien zelfde voor de hele rover 800 serie uit die tijd)? AUto start wel, draait een minuut en stopt er dan mee. PGM-FI lampje blijft branden. Ontsteking en bobine en hoofdrelais zijn ok. Bougies OK.
Hij stopt er telkens op onverklaarbare wijze mee. Is iig electrisch probleem.